Description: Perideum: The skin is charcoal black, warty to smooth. Gleba: The interior is solid and firm with light to dark gray with white marbling. Smell: Raisin/pineapple fruity when young; pungent and earthy with age. Habitat: September to February, from Oregon to British Columbia, west of the Cascades, at 0 to 6 inches depth in dark fluffy soil in 15- 40-year-old Douglas fir plantations. Edibility: Choice, but some may develop intestinal problems. Test first! 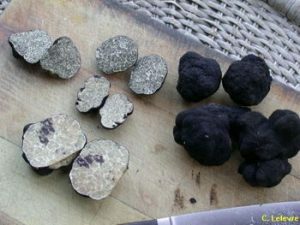 Notes: This truffle occurs in the same habitat as the Oregon White Truffle, but rarely in the same locations. It’s normally found deeper that the whites and in fluffy soils instead of denser red clay soils. The aroma is unmistakable when young, and the delicate flavor is not as strong as the whites. Bring water, milk, bay leaf, salt and pepper to a boil in a heavy saucepan. Gradually whisk in the polenta. Reduce heat to medium and continue whisking. Once somewhat thickened, reduce heat to low and stir frequently with a wooden spoon until smooth, 30 to 40 minutes. Remove from heat. Remove the bay leaf. Add the butter and cheese. Stir until melted. Peel and grate the apple. Stir into the polenta. Serve into individual bowls topped with a thin slice of unpeeled apple and shaved truffle.